Virgin Islands National Park, situated in the Caribbean Sea, is loved for its warm waters, white sandy beaches, beautiful coral and its historical past. With its subtropical climate, there is barely a difference between summer and winter. The park covers much of St. John and Hassel Island. The park has 20 hiking trails to explore, ranging from 15-minute walks to 2-hour day hikes. Visitors can explore historic Danish plantation roads, sugar factory ruins, dry cactus woodlands and more. Lind Point Trail, known for its gorgeous overlook, starts at the visitor center and ends at Solomon Beach. The Bordeaux Mountain Trail, one of the longer trails, is a steep trail that connects the Bordeaux Mountain Road with Lameshur Bay. Scuba diving and snorkeling are other popular activities in the park. Trunk Bay is home to a 225-yard underwatersnorkeling trail, and Cinnamon Bay rents snorkel and scuba gear, as well as windsurfing equipment from its water sports center. Near the public ferry dock is the Cruz Bay Visitor Center, which is open daily. Here you can find useful information about the park’s cultural history, as well as pick up maps of the park and informational brochures. Cinnamon Bay Campground and Maho Bay are the only two campgrounds located on St. John Island. Cinnamon Bay is on park property, and Maho Bay is privately owned, but still located within the grounds of the park. 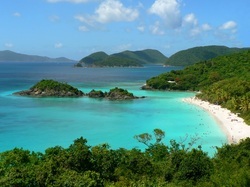 Cinnamon Bay offers lodging ranging from campsites for tents to beachfront cottages. Rates start at $32 a night for bare sites. Restaurants are available at both campsites, and within walking distance of the public dock at Cruz Bay. The wildlife in the Virgin Islands National Park provides paints a beautiful cross-section of the terrestrial, coastal and marine ecosystems of the tropical Atlantic. From beaches to salt ponds to coral reefs, there are plenty of diverse ecosystems where different kinds of wildlife live. Many of the park’s animals are not native to the region. Years of human development, and the island’s role in importing and exporting led to the introduction of species from different parts of the world. The park is home to 140 species of birds, 302 species of fish, seven species of amphibians and 22 species of mammals. Of the 22 mammal species, only bats are native to the region, and their numbers are declining. Bats play an important role in the park’s natural ecosystem by consuming large quantities of insects, pollinating plants and dispersing seeds. Three bat species are currently protected by the Virgin Island’s Endangered and Indigenous Species Act of 1990, and efforts are being made, such as installing bat houses, to increase bat populations. During the 17th century, the Dutch West India Company built settlements on St. Thomas and Hassel Island, which were subsequently conquered by the Danish and became hubs for cotton and sugar cane production. Most of the land on these islands was cleared to build plantations (therefore the vegetation today is generally second-growth). By 1733, sugar production was booming and the Danish West India Company brought in hundreds of slaves to aid in the production of cotton and sugar cane. The islands became the center of the slave trade with Africa. That same year resulted in a major revolt with slaves killing all the Europeans on the island. As part of the Treaty of the Danish West Indies, Denmark sold the islands to the U.S in 1916 for $25 million in gold. The 1930s and on brought U.S. tourism to the islands. Among the tourists was Lawrence Rockefeller, who found the islands to be so beautiful that he purchased the land and then gave it to the federal government to form the Virgin Islands National Park. 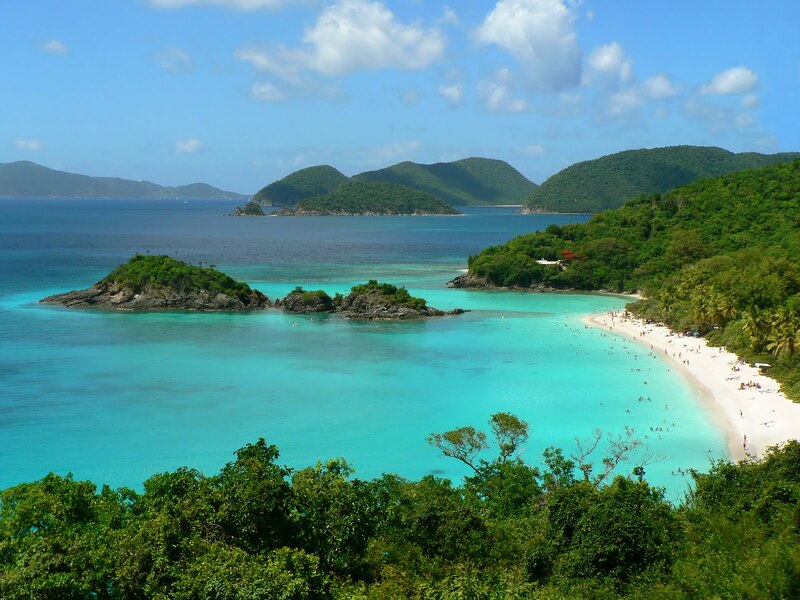 August 2, 1956 – The Virgin Islands National Park is established. 1962 – Legislation adds 5,650 acres of submerged land to the national park. 1978 – Hassel Island added to the national park. 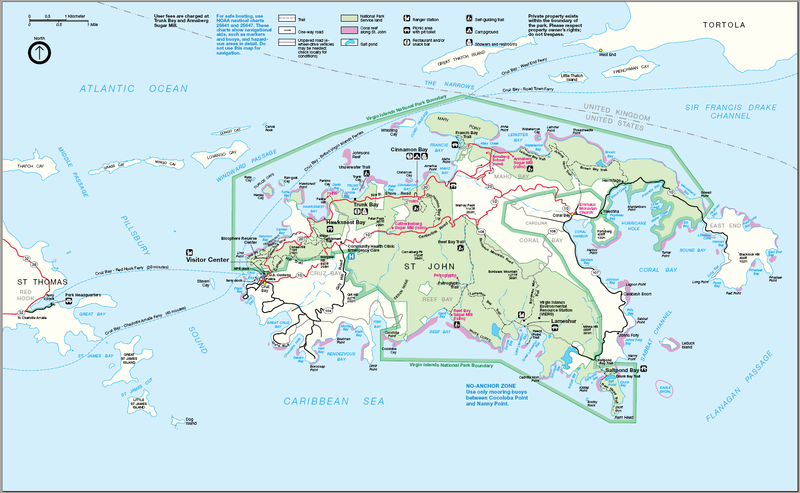 Click to see a detailed Virgin Islands National Park map.